Sherman Township was created with its present boundaries Jan. 3, 1873. The first meeting was held at the Cole school house. It was the tenth star on the flag of the county. 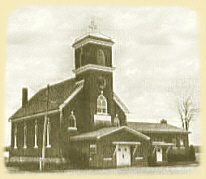 Its organizational town meeting was held at the Coles school house on April 1, 1873. The town consists of but one township, which is located in the eastern part of the county, and described as town twenty-six, range one east. Some three years before efforts had been made to have this town created but remonstrance were filed with the county board, and on the 4th day of February 1870 the board rejected the application for the new town by indefinitely postponing the whole subject. Sherman was named for General William Tecumseh Sherman, a number of its original residents having some years before marched with him through Georgia. The town has been settled by eastern people and Germans chiefly; also by people from different parts of Wisconsin. At the turn of the century, settlement was confined, but there were a few large, productive farms. In 1875, soon after the town was organized, the population was 172; in 1880 it was 300; in 1885 it was 460, and close to 600 in 1890. The officers of the town in 1890 were: Chairman, C. M. Bradford; clerk, E. G. McVean; treasurer, Otto Rehbein; assessor, John Fisher. At the onset of the 20th century, there were still some stands of valuable pine, but the greater part already been cut. There were large sawmills on each side of the town--east and west. The Spokeville lumber, shingle, lath and excelsior mills on the west line of the town, and the large mills at Spencer on the east line. These mills, although initially engaged in cutting pine, began doing a large business in hardwood. The Yellow River and several small tributaries spread over the entire vicinity. The soil is rich and easily cultivated, and the surface is slightly rolling. A stage line from Spencer through Spokeville to Loyal passed through the Town, but this was discontinued soon after a branch of the Chicago, Milwaukee and St. Paul railroad ran their line through the villages of Spokeville, Loyal and to Greenwood. Spokeville was located southeast of the village of Loyal. It was a prosperous community in the lumbering era as it had a lumber mill, a shingle, a lath, an excelsior and a spoke mill, getting its name of Spokeville from the latter. There also was a blacksmith shop, a cheese and butter factory, a general store, a school, a church and several residences. Today the area has been effectively converted to thriving dairy farms. Veefkind, between Loyal and Marshfield, also Coles Corners, between Loyal and Spencer, were active community centers in Sherman Township during the lumbering era. They too have become farming areas. Sources: Robert McBride's 1909 History of Clark County, WI; "Clark County Centennial", 1872 - 1972; "Clark County Illustrated" Saterlee, Tifft & Marsh, 1890. W. T. Sherman was a Union General in the Civil War and the commanding general of the United States Army for 14 years. His greatest feat in the war was to march an army across George, "from Atlanta to the sea," and then through South Carolina. On the way, he destroyed the South's last economic resources. Because he waged economic warfare against a civilian society, Sherman has been called the first modern general. He is supposed to have said, "War is hell." In 1864 Grant appointed Sherman commander of Union forces in the West. With three armies totaling about 100,000 men, Sherman captured Atlanta, and then started his famous march to the sea. After Savannah fell, he moved north through the Carolinas. In April, General Joseph E. Johnston surrendered to him. Sherman was born in Lancaster, Ohio. His father died when Sherman was nine years old, and Thomas Ewing, an Ohio political figure, adopted him. "Cump" as William was known, later married Thomas' daughter, Ellen. Sherman was a graduate of the United States Military Academy. He served at various posts in the South, and fought in the Mexican War. He succeeded Grant in 1869 as commanding general of the army with the rank of full general. Many people tried to induce him to run for President, but he refused. He said, "I will not accept if nominated and will not serve if elected." In 1886 William T. Sherman made his home in New York City, where he died on February 14, 1891. He is memorialized by an equestrian statue created by Augustus Saint-Gaudens, located at the southeast entrance to Central Park. He was buried in Calvary Cemetery in St. Louis, Missouri. Source: World Book Encyclopedia & Wikipedia.